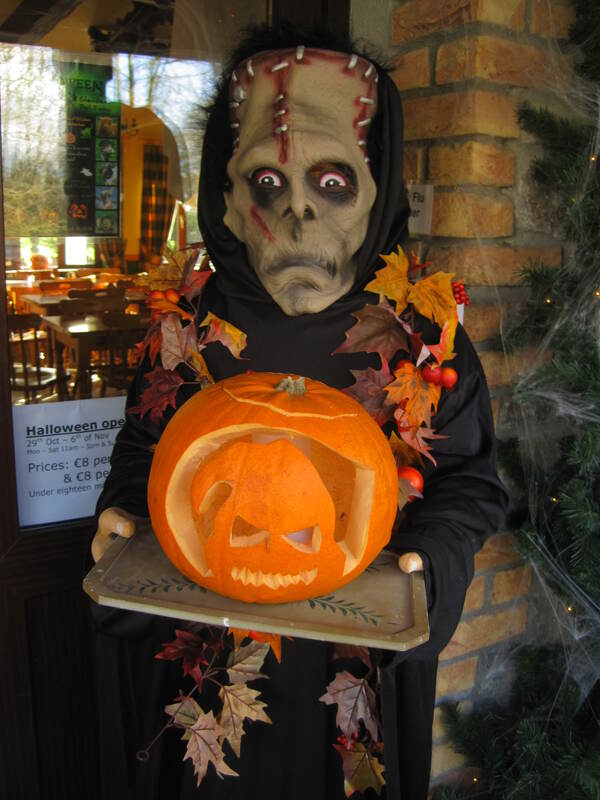 Hi all, George here again, well it’s hard to believe it’s that time of year again, the leaves are falling, the evenings are getting dark and he kids will soon be turning into all sorts of ghosts and ghouls! Myself and Gina love this time of year, we’ve had a little break and can’t wait to see all your kids and mammies and daddies coming to say hello again, but this time you can come as whatever you want….I wonder will I see any of my monkey family visiting me this year, any one dressing up as a George??? 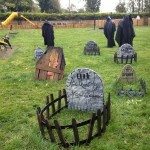 I have already loads of ghosts, ghouls, scarecrows and witches hanging around so you’ll be guaranteed a Spooktastic time! 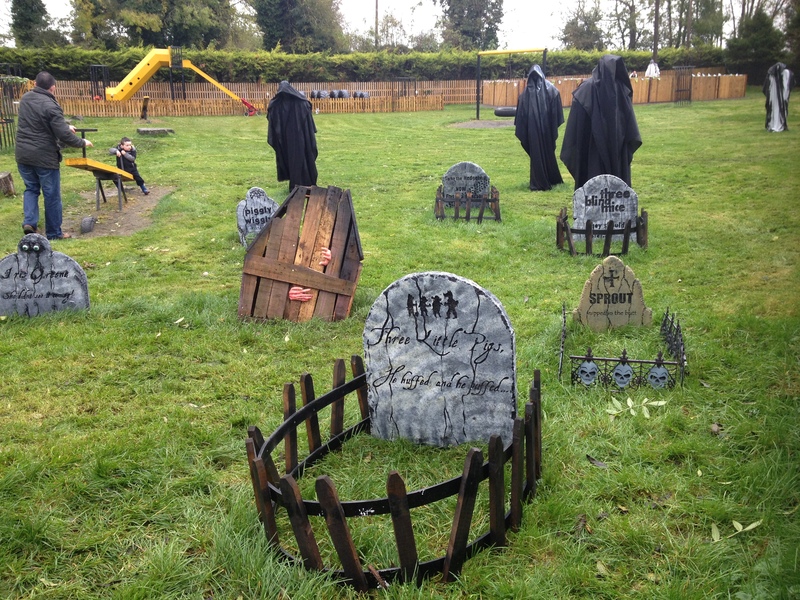 I hear Willow the witch will be popping in again this year, there will also be marshmallow toasting, and an eerie maze……but be warned, enter at your own risk! 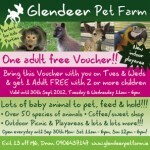 It’s gonna be a great, eerie, ghoulish Halloween @ Glendeer Pet Farm, so come along to see us all! I hope your summer was good..it was great here, even though there was a lot of rain we still had lots of people visiting, it’s because a lot of the farm is undercover & there’s lots to do even in the rain, especially with the new playground. But the farm is now closed so it’s very quiet, I can see a little glimpse of the new pictures being painted in the new play area & plans are beginning to take shape on the ‘Spooktastic Halloween event’ that takes place here at Glendeer from 27th Oct to 4th Nov inclusive. It was great last year, we had so much fun watching the kids toasting their marshmallows – that just beside our house, & it was even easier to jump up on the fence & frighten them, hehe, I know it’s bold but Gina & I love to give people a fright! But there will be lots of other little frights along the way during our Halloween Event, so come along & enjoy it! George (the monkey of course)! George here again, sorry I haven’t been blogging in a while, but our internet connection was down, I think Gina had something to do with it because she doesn’t like me spending so much time on the internet, I’m always playing games on it! It has been a fairly wet summer..well so we hear everyone saying but people still love to come & visit regardless of the weather, I suppose it’s because of the new indoor playarea, the kids seem to love that, we can hear their squeals of excitement from our home just outside of the play shed where the Skywalk playarea & the sand area are! Sometime we like when it’s raining because it means people stay under the covered area which is beside us & we get to watch them all & their funny antics for longer, ye humans can be very entertaining you know! There’s one other little thing I want to mention but I don’t know if I’m supposed to tell everyone about it …… I heard about a great deal available at the farm…actually it was Suzie the donkey who was telling me she hears all the news around here, probably because she wanders around the whole farm (she’s a bit of a gossip to be honest – don’t tell her I said that) anyway more about this deal it’s ‘One Adult Free Deal with every 2 or more children’ this deal is available every Tues & Weds until 30th Sept 2012, I’ve put up the voucher for you to print off & bring along to the farm when you visit! Gina and me hope to see ye all soon!!! Hello everyone, its George here again. I’m so happy the farm is back open as I love to see all the little visitors coming to see the animals. They really entertain me & Gina (my wife) because we enjoy watching their funny antics. 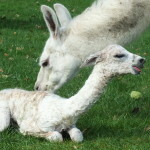 It’s great fun here on the farm at the moment with all the new born baby animals. The lambs are jumping and leaping around! I’ve even seen some very lucky children bottle feeding them, they wag their tails so much…they love drinking their bottles. Oh I nearly forgot, Mia and Leah the llamas, both had their babies a few weeks ago! Mia had a little boy called Mylo and three days later Leah had a little girl. 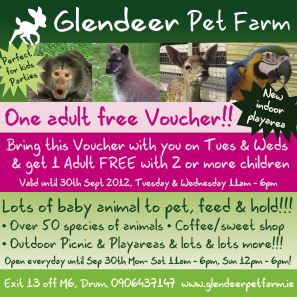 We haven’t decided on the right name for the girl yet so if ye have any suggestion check out the ‘Glendeer Pet Farm’ facebook page at www.facebook.com/GlendeerPetFarm & give us all your suggestions! Imagine that…a llama with a name choosen by YOU! The gossip this week, or so I hear from the rabbits is that the Easter Bunny is very busy getting ready for the Easter egg hunts on Saturday 7th, Sunday 8th and Monday 9th of April at 3pm each day. So make sure ye all get here on time, I don’t want ye to miss the hunt! I’m sooooo eggcited, Gina can’t wait, and I hear there is over 2000 Cadburys eggs to find this year! Can you believe it! Sooo much chocolate, pity I’m not allowed any 🙁 I might have a boiled egg instead they’re my favourite! So don’t forget to pop in & say Hello this year, we’re here everyday, looking forward to seeing you all! Hi, George here again. So Halloween is over, it was sooo much fun here at Glendeer for it, I wasn’t a bit afraid, so if Gina says I was don’t believe her. She thought I was scared of the ghouls coming out of the grave in the Forbidden Forest but I was only pretending…honestly I was! Anyway that’s over & Christmas is only around the corner which is brilliant coz I’m missing you all now that the farm is closed. But don’t worry there’s lots of work going on at the moment (I’m keeping an eye on it all) because Glendeer is being transformed into Ireland’s Lapland, it’s so exciting! The big news buzzing around the farm this week according to Ewdard the emu who was told by Mia the llama (she’s usually right) that Santa Claus is going to make his annual appearance again this year, it’s such good news! I think he enjoys coming to see us animals, he’s always laughing & smiling, he’s so jolly. 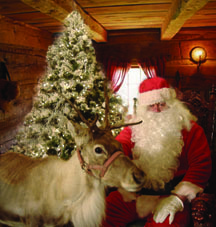 So the farm is reopening on Sat 3rd Dec @ 5pm when the big man in the red suit arrives by horse drawn sleigh & he will be here with Dancer & Prancer of course until 23rd Dec when he has to fly back to the North Pole to load the sleigh for his busiest night – Christmas Eve! Unfortunately Rudolph can’t come as he’s very busy preparing the other reindeer for their long journey. Oh I have to go & write my letter to Santa now, I just can’t wait! Its back to Exit 13 again! Its George the Capuchin monkey here again. I just wanted to tell you all that the road diversions are all finished, so its back to Exit 13 of the M6 again and follow the signs for Drum and Glendeer Pet Farm. All the animals wanted me to tell ye that there is only 9 days left till the farm closes for the summer season, Sunday the 2nd of October. Then we will all be very busy getting ready for our Spooktastic Halloween Adventure which starts on the 29th of October. I will keep ye posted on the progress for our scare fest! There are also some new baby arrivals to the farm since I was talking to ye last. 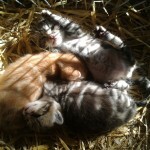 Tabby the cat had three lovely little kittens just over 4 weeks ago. 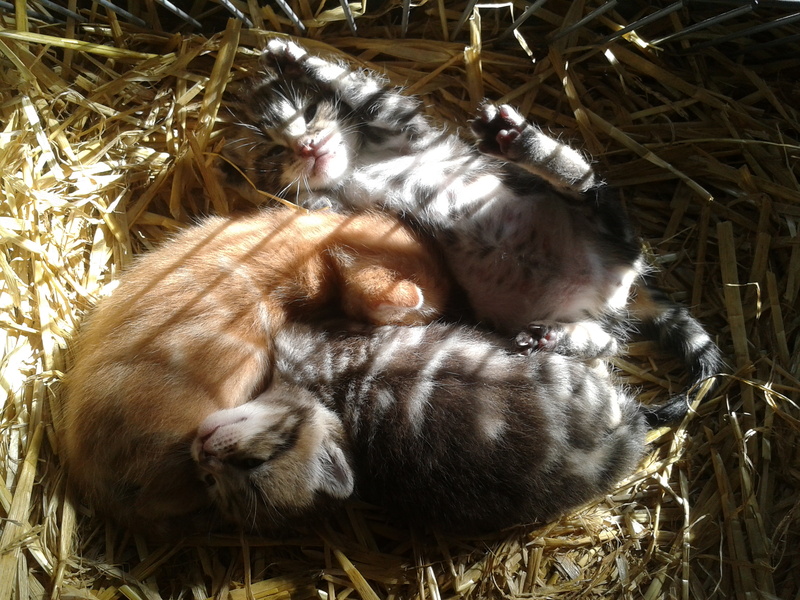 There are full of mischief, jumping and climbing everywhere, very cute! Also Snuffles the pot belly pig had four little piglets a week ago. There getting very big already! We have them under a red lamp to keep them nice and warm. 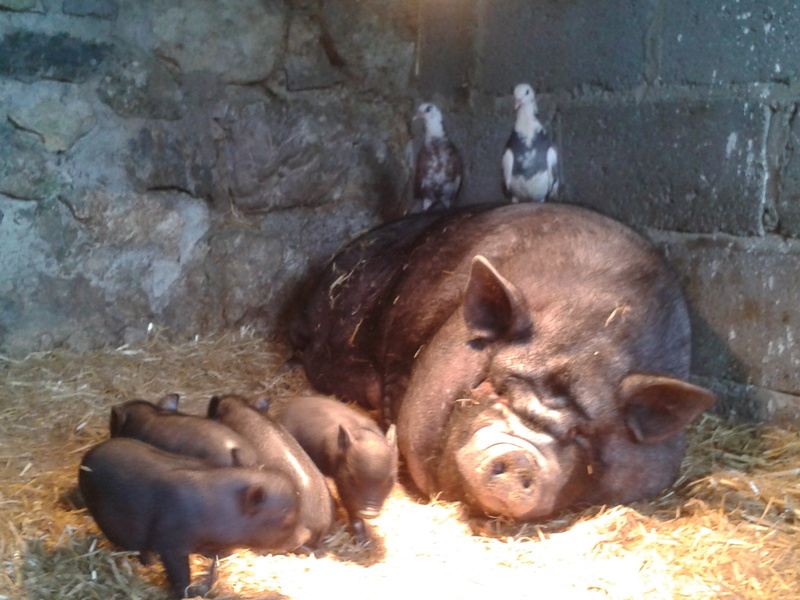 However the pigions have decided that is one of the most comfortable places on the farm at the moment and have moved in with the pigs. 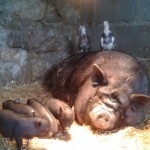 They spend most of there time perched on the mammy pigs back enjoying the heat! Clever pigions! Check back next week to find out about all the ghoulish events that will be happening over the Halloween break!